This bar hides a secret weapon; behind the creamy yogourt and bright, citrusy notes, you'll discover hints of sweet cranberries. The result: light, fresh and uplifting, just what's needed to finish strong. And SoLo GI™'s first bar to have it’s very own fan club! 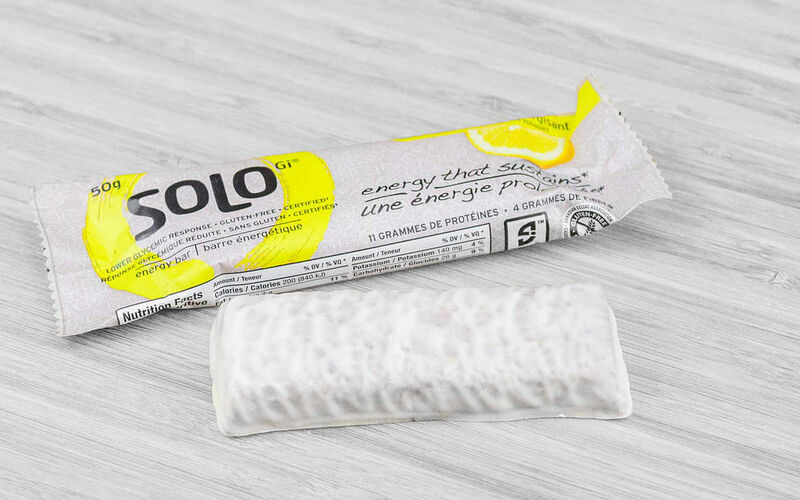 SoLo GI™ protein blend (whey protein isolate, whey protein concentrate, soy protein isolate, soy crisps (soy protein isolate, rice flour, salt)), yogurt coating (sugar, palm kernel oil, whey powder, skim milk powder, yogurt powder (cultured whey and skim milk), soy lecithin, vanilla), fructose, soynut butter (soybeans, soybean oil, maltodextrin, sugar, palm oil, salt), brown rice syrup, fruit puree (white grape juice concentrate, prunes, dates, fructose), dried cranberries (cranberries, apple juice concentrate, sunflower oil), soy nuts, SoLo GI™ fibre blend (inulin, oat beta glucan), natural flavours, sunflower oil, soy lecithin.